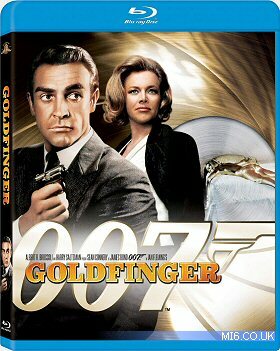 MGM and Fox released three James Bond films on Blu-Ray on 24th March 200 in the USA. Available as individual titles or a boxset, the films have been restored and re-mastered for the highest quality picture and sound quality via the state-of-the-art Lowry process digital frame-by-frame restoration. Featuring special features galore, Bond is primed for Blu-ray Disc with a selection of 007 adventures spanning the storied career of cinema’s most recognisable spy. The second phase of three titles include Goldfinger (1964), Moonraker (1979) and The World is Not Enough (1999). Blu-ray Disc is the next generation optical disc format developed for high-definition video and high-capacity software applications. A single-layer Blu-ray Disc holds up to 25 gigabytes of data and a dual-layer Blu-ray Disc holds up to 50 gigabytes of data. This greater storage capacity enables the Blu-ray Disc to store over six times the amount of content than is possible with current DVDs, and is particularly well-suited for high definition feature films with extended levels of additional bonus and interactive material. Win 007 Blu-Ray Wave 2! In the original cut of "Goldfinger", how many seconds were left on the bomb countdown when it was stopped? The competition closes at midnight GMT on 13th May 2009. MI6 will choose the winners at random from the correct answers received. The winners will be contacted via the email address supplied and their postal address will be requested. If a winner fails to respond within 7 days of prize notification, another winner will be chosen until all prizes are allotted. Competition is open to USA based MI6 readers.